Includes VAT, delivery and starter kit. The Catalina Carnival is a Swimspa, Swimtrainer and Party Spa, following the success of the Mardi Gras the Carnival is a swim trainer and party spa without equal. It features 2 semi reclined deep massage seats and bench seating, with back jets, for an additional 8 people! It also has the Catalina Pro Swim training System gives you a low-impact, full-body workout which builds muscle, increases endurance and burns calories. This swim trainer provides the same workout as swimming in a pool without the need to turn! The powerful pumps can be diverted to the river swims jets to offer a comfortable swim or aqua jog and for the serious swimmer or workout use the Catalina ‘pro swims system‘ that simply cannot be beaten. Delivery and installation in Leicestershire and Rutland will be free, for all other locations please contact us for delivery and installation costs. Delivery and installation in Leicestershire, Rutland and the surrounding counties will be free, please consult us for delivery and setup costs outside this area. 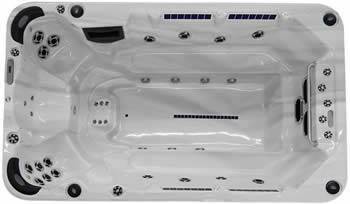 Leicester Hot Tub Hire Ltd is registered in England and Wales 5672165 on 11th Jan 2006. Registered office: 18 Cranbrook Road Thurnby Leicester LE7 9UA. 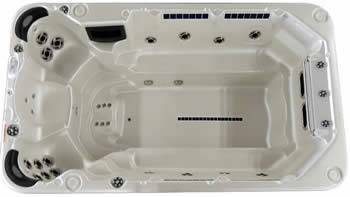 Leicester Hot Tub Hire Ltd acts as a credit broker and only offers credit products from Secure Trust Bank PLC trading as V12 Retail Finance. 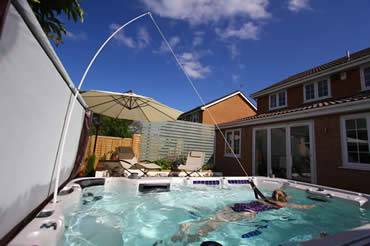 Leicester Hot Tub Hire Ltd is authorised and regulated by the Financial Conduct Authority. Our registration number is 732621. Credit provided subject to age and status.